Family Community-Led Ceilidh with a Twist of Science. “Ever heard of the Dashing White Blood Cell? Or the Canadian Brain Dance? 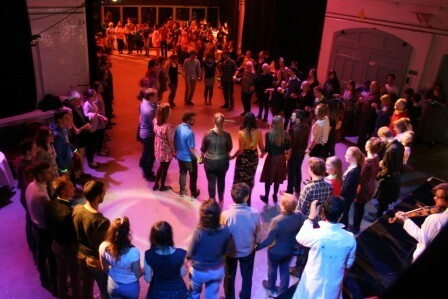 If not, then you’ve probably never taken part in the latest trend in Scottish folk dancing – a science ceilidh. The events combine traditional music and dance with basic science concepts in a bid to make science more accessible and fun. It may seem a bit strange that the Gay Gordons can explain enzymes, but neuroscientist Lewis Hou, the fiddler behind the unusual ceilidh, claims dance and science are extremely compatible. Mr Hou, a research associate at Edinburgh University, said: “I come from a background of science and music and I realised that there were a lot of similarities between teaching people dance and teaching people science. They kind of have a similar process. A lot of the ceilidh dances work really well with different elements of science – for example the dashing white blood cell demonstrates the immune system with its red blood cells and white blood cells. As you explain the dance moves, you’re telling people to circle around the blood for eight. The events are proving popular with both scientists and dancers alike, with the organiser’s biggest ceilidh at the Edinburgh International Science Festival selling out. The next one is due to take place on October 19 as part of the Midlothian Science Festival. However, this will take a slightly different format than usual, with community and school groups being encouraged to develop their own dances based on science. This event is ticketed and costs £3.00. Tickets can be bought here or via the URL in the ticket section below. Venue has disabled access and disabled toilets.